Spinach a leafy vegetable is considered to be an important food ,offering many health benefits. They are rich in Calcium, Vitamin K, Folic acid and Iron. Heat oil in a pan, Add the spinach and green chillies and fry them well. In a cooker,heat oil/ Ghee . Add the chopped onions and corn saute it well. Add the ginger- garlic paste to it. Now add the grinded ingredients and saute them well until the raw flavor extract from it. Add the grinded spinach to it. Finally add the rice with 3 cups of water along with salt. Allow it for 2 whistles. Spinach and corn, yummy combo... looks delicious. Lovely combination, pulav looks delicious.. 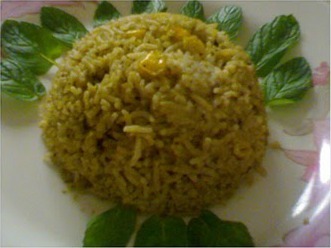 Healthy and mouthwatring pulav...must try..looks great..
very healthy with the greens..nice !! Healthy and delicious dear... Yummy combo..
Looks very interesting..very healthy too.. This combi is very healthy and tasty as well. 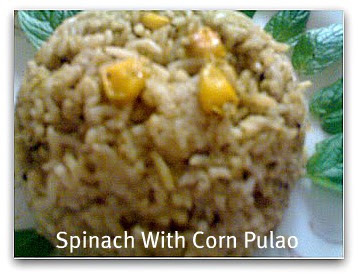 wow, what a lovely combo, love both spinach and corn, the rice has to taste yummy.. Delicious combo, isnt it? Love the color n flavor!! nice combination,looks delicious n healthy too..
Lovely combination, looks yum !